Wildlife officials in Denver, Colorado announced Thursday that a new strain of bacterial infection has struck the local duck and goose populations around the city. In this press release by the Colorado Parks and Wildlife Department, several birds have been found dead in city parks. This disease affects most waterfowl species and some poultry. It’s caused by large populations of waterfowl congregating in one place which makes spreading illness even easier. No other diseases were found to be present in the dead waterfowl examined, but wildlife officials express caution with coming in contact with dead birds. If the public sees a dead bird, please report it to officials immediately and do not handle it. Pets should also be kept from coming into contact with waterfowl in city parks. Denver city parks are known for housing large populations of Canada geese that can be a nuisance at times. What is new duck disease? 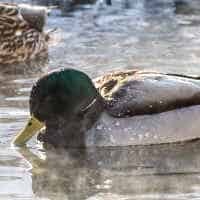 New duck disease causes sneezing, coughing, and trembling of the head and neck in waterfowl. Any ducks and geese with these symptoms should be avoided.